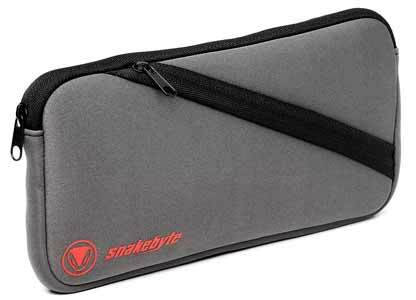 To compliment your new Nintendo Switch Snakebyte have released several accessories for the console. Built from durable neoprene material the CARRY:BAG is a soft case in black and grey to compliment the console. It consists of a main zipped pocket with a smaller one on the outside of the main case for game cartridges. The case will hold the console with the joy pads attached and according to the box the case is ‘Holdover Compatible’. I have several issues with the bag in general, mostly I’m unconvinced that it has much functionality over that of a dust cover. The non-rigid design means that you must place the console into the bag through the main zip. The bag offers good clearance and for most adults this will not be an issue, but the thought of the possibility of catching the joysticks or scratching the screen on the zip means that it’s not suitable for children. There is also the issue of how much the case would protect the console from inclement weather, by the looks of it, it would be good against a smattering of rain, but I’m not convinced I would want to be carrying it around in a downpour and the soft cover gives no protect from accidentally bending the console. As a dust case it's ok, but the level of protection it offers does not outweigh the problems of getting the console in and out of the bag.